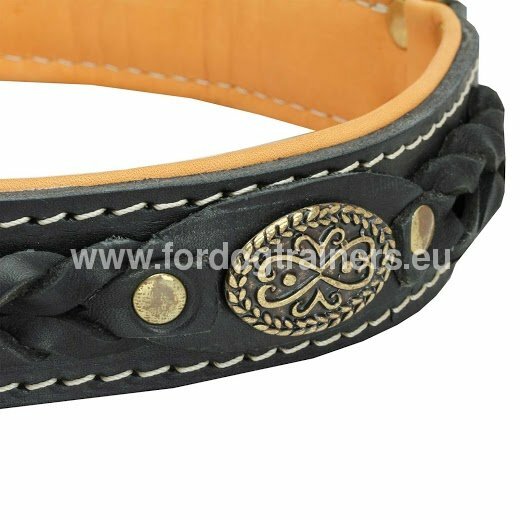 Leather Collar with Exclusive Design for Great Dane padded with nappa leather. 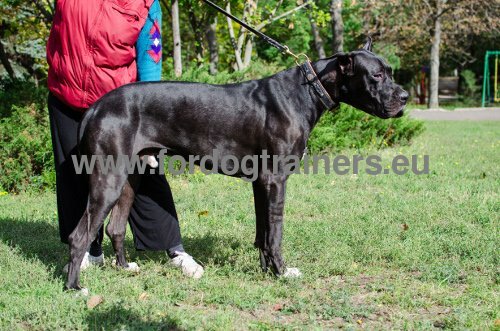 The Great Dane is called Apollo of the dogs, externally as well as by his character, so he needs high quality equipment, beautiful by look and durable. This is why we call your attention to this Leather Collar with Exclusive Design, the true masterpiece, stylish, durable and affordable. Our collar is hand made and hand stitched, specially riveted for increased reliability. Leather braids and metal decoration add to the originality of the product. We have also put rust proof hardware made of stainless steel, so you can be sure this Leather Collar will serve your Apollo for many long and happy years! 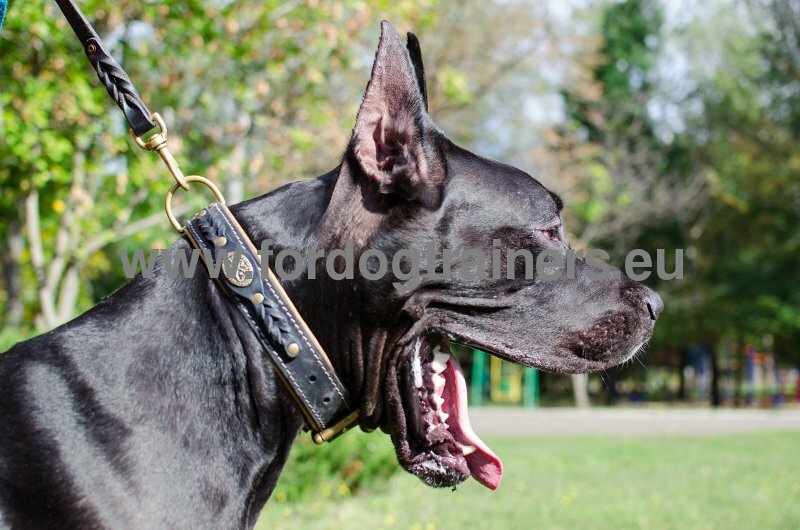 Hole A on the dog collar is the size of the collar in an unfolded state. In general, there are 5 holes, spacing between two holes is 25 mm. 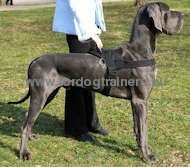 But on the dog's neck, the size of the collar will correspond to holes B or C. As the collar is made of double leather, it is thick and difficult to fold. 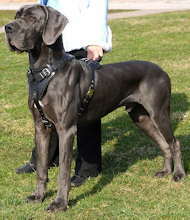 For example, your dog's neck size is 55 cm. 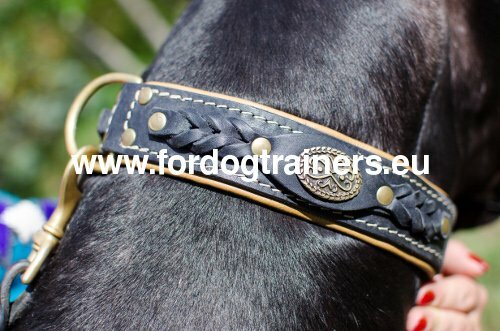 If the hole A is located at a distance of 55 cm from the edge of the collar in an unfolded state, being put on the neck of your dog, this collar will be fastened on the hole B or C.
1. Hello dear team I would just like to announce that the collar arrived safely today So all is really the best. It looks super cool! It fits my Grate Dane really great! 3. Hi, Thank you for attention and assistance. My doggy from shelter is a kind of great one. 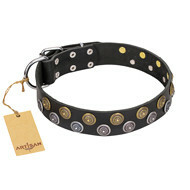 This collar I purchased attracts a lot of attention and is often complimented. 4. 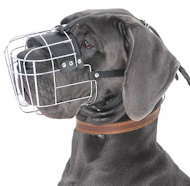 Hello, I've got my order yesterday, the products are exactly what I need for my160 pound bullmastiff. These two collars are beautiful and impressive, my dog likes them. I recommend you to my friends who admire your products on my doggy. Please do not hesitate to take a look at other time proof products for German Shepherd in our store!